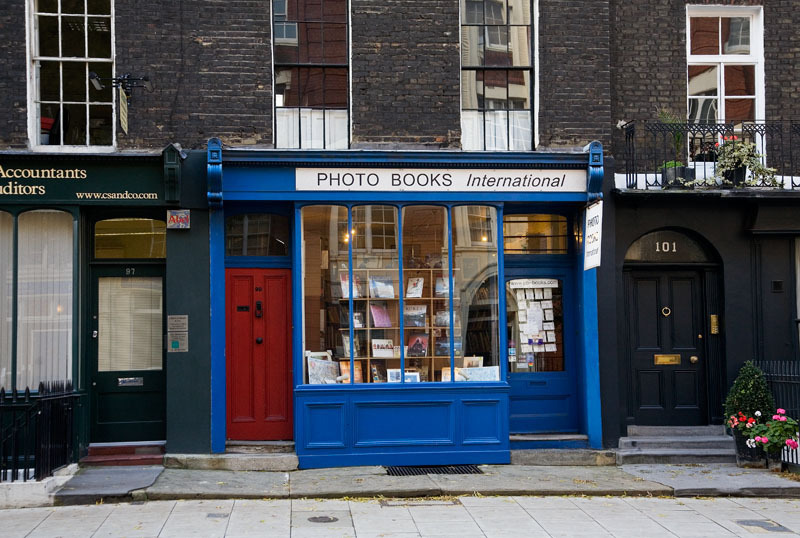 Located near the heart of London is a quaint and almost quintessential London book seller, but with a wonderful focus that is exclusively on photobooks. This is a small, well organized and run book shoppe, just as I have imagined my distant relative John Stockdale, publisher and bookseller of Piccadilly in the late 1700’s in London. 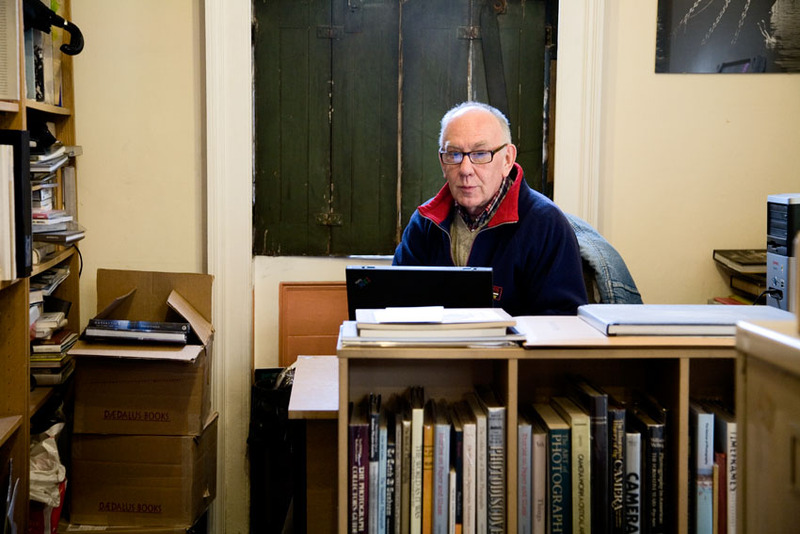 Photo Books International (BPI) is a 13 year joint venture between Jasper Howard (above) and Bill Herbert. I had the opportunity to drop into their tidy and very well stocked shoppe and was immediately lost among the potentialities. Their inventory is extensive and decently priced. And yes, very recommended! Not evident are the three books I left with, the Roni Horn’s 2000 stiff-cover edition of PI, Mona Kuhn’s 2004 hard-cover edition of Mona Kuhn Photographs (completing my collection of her three published by Steidl and I will soon be reviewing the series) and Jock Struges 1991 stiff-cover edition of The Last Days of Summer. I was self-limited by what I could carry during the remainder of my current trip. While discussing with Jasper about his shoppe and his observations about the state of photobooks, he did mention that they were still interested in purchasing photobooks. If you are interested in selling your photobooks, please first send him an email of what titles and condition before dropping in with the over-stuffed bag. Since his inventory is large, he is interested in filling in his missing spaces. And yes, it seems he knows where every title is lurking within the store. This was my first visit to London and I will have to say, when I return again, PBI will be on my short list of places to revisit. Update: Photo Books International is now closed. I had heard rumors of this, but as noted in one of the comments below, it is now a fact. I also realized that the portrait of Howard was really terrible regarding the color balance, so it needed a do-over and update, above. Now Howard is looking pretty good. this is your old pen friend Juergen from Munich. I’ve often thought of what might have happened to you. Some time ago I found this website of yours. I didn’t notice that I could have made a comment. So I’m doing it now: Congratulations for your beautiful shop. I hope you’re fine and business is running well. I would be happy to get an e-mail from you. I also hope I didn’t annoy you some time, because I haven’t received an answer from you for years. Best wishes and hoping to hear from you soon. Me and a friend went to visit photo’s books international a little while ago and were shocked to see a empty shell of once a great bookshop 😦 we had been going there together for years, could you shed some light on what has happened to the shop/the owner? Craig, I had anticipated the closing of the this great little book shop when I last visited with Jasper in late 2010. His life partner was seriously ill and apparently not going to be getting better and it was his partner who was the driving force behind this book store. As Jasper was lamenting to me; this is a two-man business and it was now entirely up to him to keep it going. He looked and acted tired. I sensed then that with the eventual passing of his partner, that Jasper was going to sell out and move on. It now appears that he no doubt did. A loss on many accounts.